One way to understand daily interaction, and intergenerational resource exchange, is just to look at the structure of households. This doesn’t tell you everything that goes on in households, but it gives some strong clues. And we can measure it going back more than a century, thanks to IPUMS.org’s collection of Census microdata. In 1900, the most common situation for an American was to live in a household where the age difference between the oldest and youngest person was about 38 years. Now the most common situation is an age range of 0 — either living alone, or with someone of the exact same age. 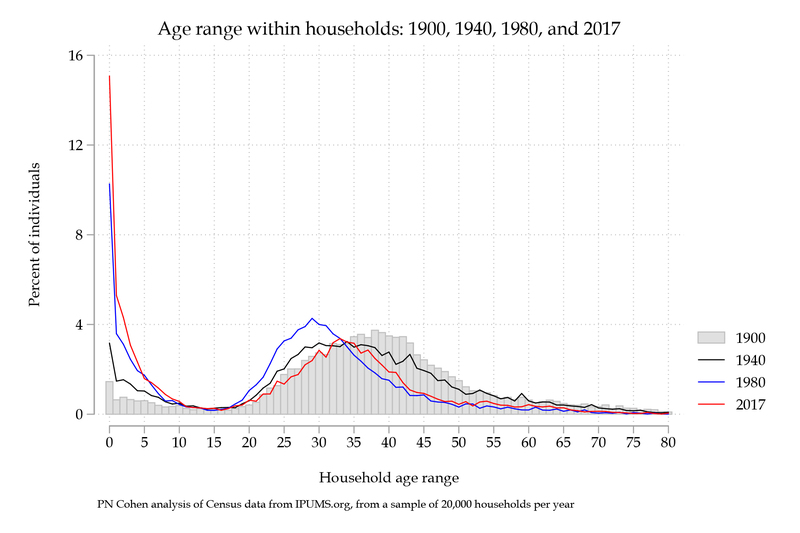 And there are a lot more people living in households with only similar-aged adults, with age ranges of less than 10. In between 1900 and 2017, life expectancy increased, the age at first birth increased, and the tendency to live in multigenerational households fell and then rose again. So the household structure story is complicated, and this is just one perspective. But it’s one indicator of how life has changed. Line up your household from youngest to oldest, look to your left and look to your right — how far can you see? Data and Stata code (for all decades 1900-2000, then individual years to 2017) are available on the Open Science Framework, here.